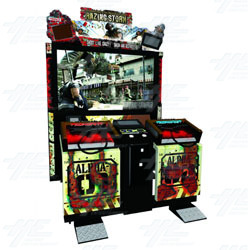 Namco has dramatically reduced the price of the last brand new units of Razing Storm DX. Stock is extremely limited. Please understand that these are the very last new units remaining with the factory. If you have interest, please contact our sales team immediately. Razing Storm has a machine gun controller that shakes and generates sound through a speaker in the gun. The cabinet has a 60 inch DLP monitor, and 5.1ch DTS Digital sound is used. The machine also features an action pedal which allows you to take cover and avoid gunfire.